This image is from a 6th/7th century die for making decorative helmet plates. 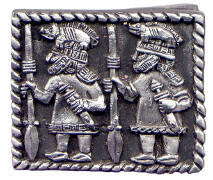 The figures are wearing boar crested helmets probably connected with the cult of the Norse God Frey. This image is taken from a 6th/7th century die for making decorative helmet plates. 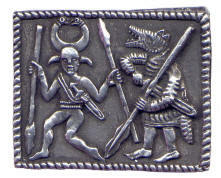 The dancing figures are wearing animal head-dresses probably connected with the warrior cult of Odin. This image is taken from a 6th/7th century helmet plate from Vendel, Sweden. 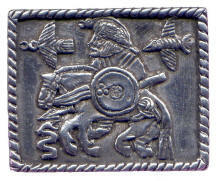 It probably represents Odin, accompanied by his two ravens, Huginn and Munnin. Modern Leather Belt with a Knot work Design. It has a press stud fastening, to fit any of the MB Buckles. (interchangeable) Black or Brown. Please let us know your waist size when ordering. 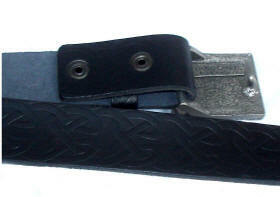 Pictures below show MBB Belt with MB1 Buckle to illustrate how the combination works.